Taylor's Sweet Little Art and Nerd Site: Painting of the Day- Deep Space Drifter! Painting of the Day- Deep Space Drifter! Space is a cold, dark, and lonely place. This piece, "Deep Space Drifter", I created to have a good portfolio and conversation piece. I wanted to take two very distinct movie genres and merge them into one. Let me explain. 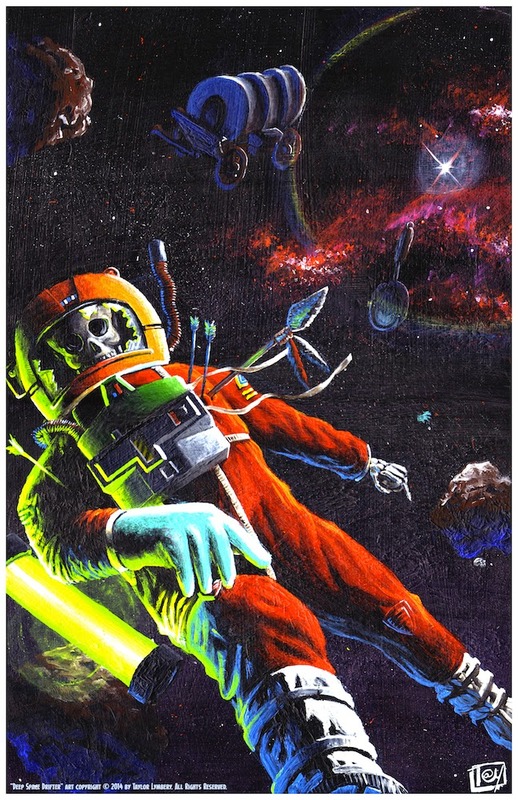 I wanted a space painting where you have the dead skeleton in a space suit. That's not a new idea, but my thought was this, space is a cold vacuum. I don't think an astronaut's body would deteriorate in space. I might be wrong, but that doesn't seem scientifically sound. So, I came up with a slight answer; time travel and the chaotic old wild west. I get to keep the iconic skeleton in the space suit and I get to add some intrigue that leaves the viewer wanting to know more. The title of this piece is a play from one of Eastwood's "Man with No Name" movie titles; "High Plains Drifter". I think it works well! I will offer this piece, not only for sale but also for print at the upcoming Dallas Comic Con in May 2014. This piece is an acrylic painting on a 11" X 17" piece on poster cardstock. You can see this piece in my deviantart gallery as well here. "Dragon Camp" art by Taylor Lymbery 2014.